Although there were so many great vendors at Quilt Con a few weeks ago, I found myself a bit overwhelmed and ended up not buying anything except a lovely little bundle of Oakshott Fat Eights! I have loved these luxurious cotton colors for a while now and when I saw the booth (sorry, I didn’t save the card for the supplier) with the cottons so beautifully displayed, I just couldn’t resist! It took me a while to even unwrap them as I knew I would have to “muss” them up in order to wash them; a step I can no longer skip. In my earlier days of sewing, just a few short years ago, I didn’t really have a preference. Then I heard many arguments on both the side of pre-washing and not pre-washing. I eventually went to the pre-washing camp! Anyway, here is a sample of one in its pristine pre-washed folded state. Lovely right? Well, being the pre-washer that I am, I set my daughter to task, happily unfolding and tossing in the washer, all the rest of my lovely bundle. I kind of had a bad feeling about this load, because they were so small, but I took my chances and washed away. After the dryer finished with them, they came out a little…… ahhh, less pretty shall we say? I know, what a sad sight. Of course I knew they would turn out like this, I was keeping my fingers crossed though that a nice hot iron would bring them back to their former beauty. So I set to work this time with the very (for me) therapeutic task of pressing each one. I sprayed some water on each one and pressed away. I was so pleasantly surprised at how beautifully these pressed out. They are good as new and ready to be used. So in the end, it all worked out but I’m wondering if anyone has suggestions on what to do with these littler pieces; fat quarters, fat eights, to keep them from getting so tangled up. Some may be wondering, why do I go through this step each time I buy new fabric? Well I know for me, I like knowing that all the factory “gunk” is off of my fabric. I’ll admit it’s likely a weird neurotic notion I have…… but I kind of feel like, “It’s mine now and I want it to be cleaned of any of it’s former “stuff”! Also, I want to get any and all shrinking done prior to using it. Is this a valid reason, well valid enough for me. I have friends who swear by not pre washing and others who, like me, can’t imagine NOT pre washing. I know there is likely the good, bad and the ugly about both ways. I surely don’t love wrestling with my fabrics and all the loose threads wrapped so crazily around each other after the dryer cycle, but it’s worth it to me to know that they are clean and ready to use. I suppose there isn’t really a right or wrong, but I sure am curious if any of you have strong opinions on the matter. Happy fabric hunting, buying, washing (or not) and using!! Yes, of course Cathe, yet another good reason! Thank you! I always prewash, but have not tried working with tiny precuts, just FQ’s or yardage. I heard that there are chemicals in the fabric and ships that get the fabric into the country (against “fabric eating critters”). Do not want that nasty stuff in the fabric or on my hands for that matter. Two good reasons to prewash! Thanks for including that relevant link to Christa’s blog. I have never ~knock wood~ had problems with color bleeding so that hasn’t really been a reason for me but after reading that post I’m even more inclined to pre-wash! I too prewash. The smaller pieces I stuff into zippered lingerie bags and they don’t get tangled at all. I was thinking of using one of those….. 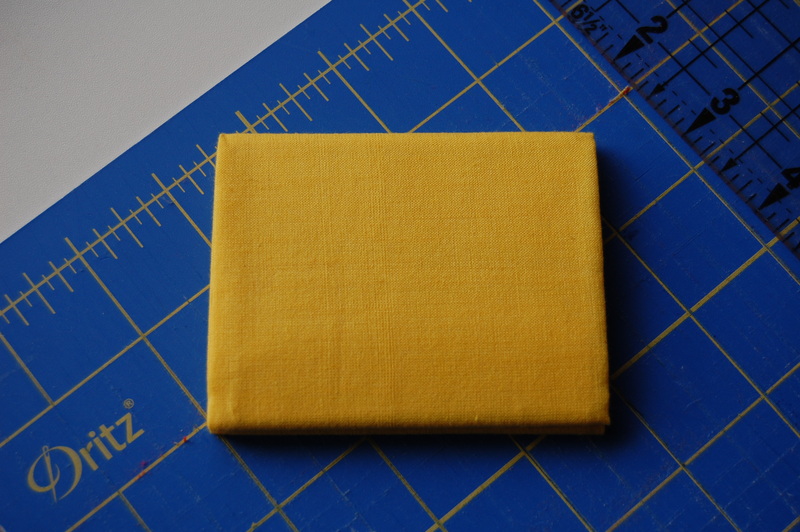 I usually sew several of the quarters or eights together using the largest stitch. This means you will sew on both cut edges to secure as many pieces as you wish to. The drying is done on medium, but it takes a little longer and guess what you only have a few ragged edges that can be cut all together. Yet another great idea! Thanks so much! I’ll have to get some of those color catchers!! Maybe My fabric really is bleeding and I’m just not aware. I usually do darks and lights seperately but maybe that’s not enough. Thanks for the tip! I only pre-wash if I am making clothes because I don’t want them to shrink. I always use Color Catchers when I wash my quilts and I love the crinkly look that happens when I wash the quilt. I also think the sizing in the fabrics help them hold their shape when sewing. I totally respect all of you out there that pre-wash but I just haven’t found a compelling reason to take that step first. Irelle…. the debate rages on!! We’ll have to continue this at our next MQG meeting :-)!! I agree about the sizing helping them hold their shape but I don’t find it make that much difference for most of my work. When prewashing, I snip a tiny bit from each of the 4 corners of each piece of fabric to help prevent fraying. It’s also a good way to know later if a piece of fabric has been prewashed. Sometimes the pieces still fray in the wash a bit–certain brands seem to do that more than others. Some quilters at a guild near me use Shout color catchers when they wash their fabrics. I have never heard about the snipping corners tip. Thank you!! I have a friend who uses her wavy blade in her rotary cutter and runs it over each edge. I haven’t tried this. I have cut the corners with good results. I always prewash. I dont want to have the fabric bleed at a later date. I like the idea of a bag for smaller pieces. I will try that this weekend. these are beautiful. So looking forward to see what you make with them. I don’t pre-wash. I just can’t imagine all the time I would need for that. I generally dislike laundry very, very much so if I can’t get away with not washing, I will. oh, I meant if I can get away. Ha… so funny…. I generally dislike it very much too, although with three little ones it seems to be what I do more than anything. I figure if I’m washing anyway, I may as well just toss my fabric into one of the loads!! And, like I said, I have this wierd affinity for ironing!! I’m a prewasher for sure. I would just lose my mind if one of my quilt tops bled because I hadn’t washed the fabric first. Oh, can you even imagine? How anyone can even begin to use a lovely piece of fabric that has not been laundered and pressed by themselves is beyond me. It’s part of the process of life. I know, I know. Fanatic. Maybe. But when I working so closely with fabric I wish to know that it has been cleaned by me. And also, the blog from Christa (and the fabric that bled in her beloved quilt) is a good reason to prewash if ever I heard one. Well that’s my rant on prewashing. I so appreciate and “get” your rant! 🙂 Thanks! I love this fabric and was introduced to it at QuiltCon! Thanks for that link. I actually found mine at a different booth I believe- a shop out of Canada? Glad to know I’m not the only one who finds ironing theraputic! I also like to get the chemical finish off before I handle fabric as much as you do in making a quilt. I don’t prewash charms or jelly rolls, though, even in a lingerie bag it doesn’t work so well, but I rarely use those anyway. I bought some lovely Oakshott at QuiltCon, too, and can’t wait to use it! I generally only prewash if I am using the fabric for clothes and a few other things, and I find it helpful to put the fabric in a zippered pillowcase covers! When I am washing a lot of fabric I and don’t have enough of the covers I also put them in regular pillowcases and just tie a knot in them so the fabric can’t get out. Hope that helps! Also congratulations on your win, even if you understandably have mixed feelings on the win. It is a lovely quilt! 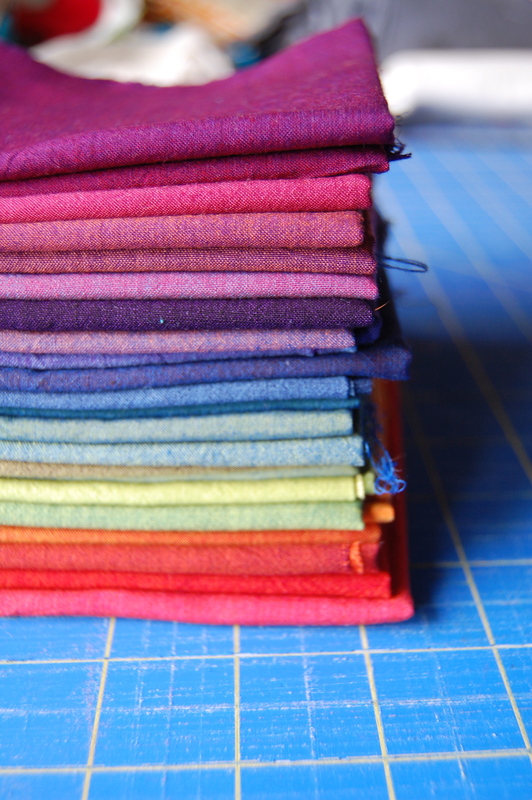 I mostly quilt with my own hand-dyed fabric, which gets rinsed excessively and than washed in the machine before use. When cutting the lengths I plan to dye, I use my zig-zag rotary cutter, which results in absolutely no fraying or tangling in the dryer. Aaahhh, to me, dying my own fabric for my quilts would be Quilting Nirvana!!! It’s my someday goal. 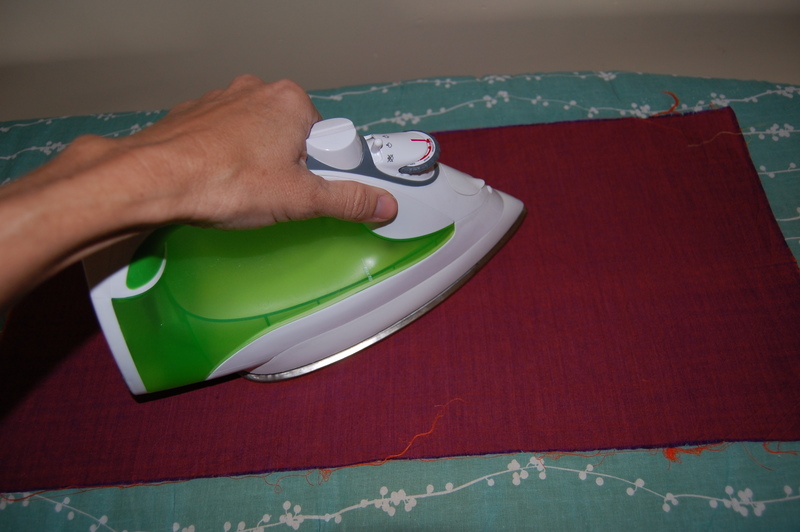 Sounds like your cutting tip would work for all fabric prior to washing…. thanks so much!! I didn’t even know a ziz zag rotary cutter existed!! I am firmly in the pre washing camp. I snip the corners which helps avoid some unravelling and use a lingerie bag if the pieces are small. I always use colour catchers too. I’ve used Oakshott fabrics and just love them! i have a great lingerie bag, its just from target or walmart? however it has 5 or so separately zipped compartments in the one bag. i use that and then throw in two colour catchers. I’m a prewasher for the reasons you mention… and I use Carbona reusable Color Catcher cloths (good for 30 loads). It has amazed me how much dye comes out of “high quality” cottons sometimes. I now have two dark purple cloths which I use for cleaning – love that I haven’t thrown 60 disposable sheets into the landfill. If you are going to the next Mod Guild Meeting, let me know and I’ll bring you one. I ordered several from an Amazon seller recently. I use quilt basting pins and pin along the folded selvedge edge of my yardage, and even fat quarters, before throwing in the washing machine. This prevents a huge amount of those horrible tangled hunks of fabric! I love that there are reuseble Color Catchers…. thanks for that valuable tidbit. I would love to “borrow” a sample and do plan to be at the next meeting! I think I’ll give the pinning idea a try on my next pre wash load! Thanks Liz! I trim a small bit off all the sides of my fabric using my rotary cutter with a blade for pinking. Of course you could always use pinking shears but the rotary cutter is so much faster. I also highly recommend Carbona. I found it accidently because it was the cheapest color catcher at my grocery store! 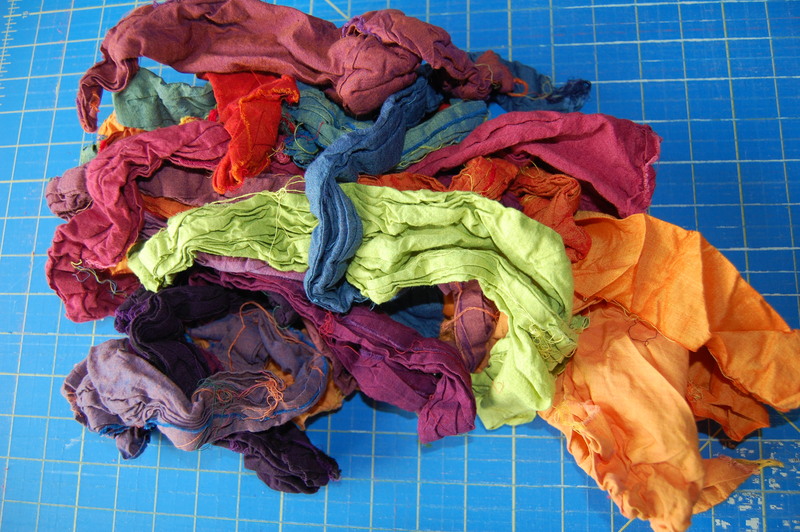 oops – the “problem” I’m referring to above is tangled threads when prewashing fabrics. I wash for all the same reasons you do (they go staright from the front door to the washer). Mostly though it’s therapeutic. I use a pair of pinking shears & cut just the cut ( not selvage) edges a tiny bit. I only ‘wash’ on the rinse cycle for about 2 minutes, spin & then dry on low temp. The ‘pinking’ of the edges prevents tangled threads & they are not all twisted from the washing agitation since it’s only a small potion of a cycle. I have heard that the pinking shear method can be really helpful. I guess the 2 minute rinse cycle is enough to get the excess color out of the fabric? Thanks for the input. I am learning so much from all of you…. I always safety pin the edges together on my fat quarters as well. It works great–although the holes may bother some folks. I use the color catchers too. I just buy the regular ones, and have found through experimentation that they are reusable. When they get pretty off colored, then I through them out. 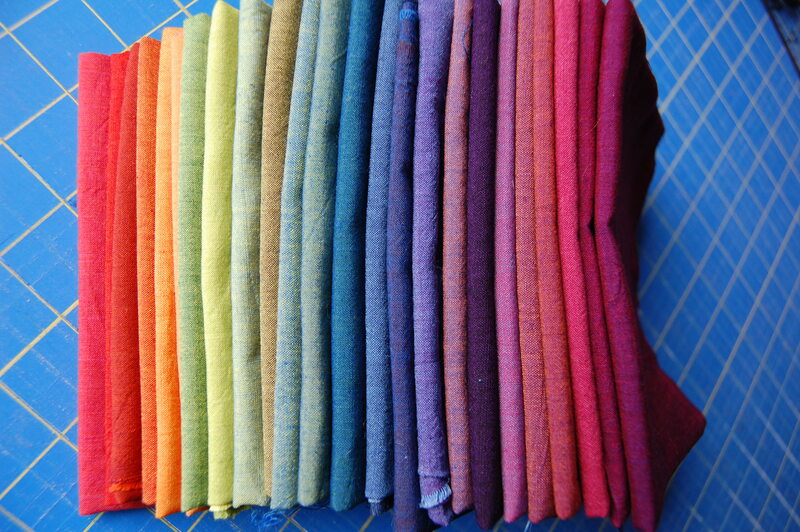 Love the quilt that you made from these! Thanks for that tidbit Monica! Great to know you can use those color catchers multiple times! Karen, did you ever get the reusable Carbona Color Catcher? I have one for you if you are still in need…. but I won’t be at our next meeting. If you email me your address I can pop it in the mail to you.